Seven years since it started with J.J. Abrams’s reboot, Star Trek‘s five-year mission reaches its half-way point in Star Trek Beyond. With Abrams having jumped ship to another space opera, directorial duties have fallen instead to Justin Lin, who previously helmed four of The Fast and the Furious movies. Idris Elba joins the cast as the main villain, Krall, with all the Enterprise crew reprising their roles, including for the last time Anton Yelchin, who passed away before the film was released. Reviews have been positive and box office buoyant, suggesting this version of the franchise could continue in cinemas for a while yet, even though the new tv series Star Trek: Discovery coming next year is apparently set in the “prime” timeline of the series rather than the one established in these movies. With Lin directing, there had been some speculation that Brian Tyler might land the gig of scoring the movie, given their prior working relationship (five films). I’d have liked that actually – Tyler is a die-hard Trekkie and I imagine would have written something spectacular. But instead the ever-busy Michael Giacchino has extended his shift on the franchise, which can hardly be seen as a disappointment given his excellent work on the last two films, becoming in the process only the second composer to score three Star Trek movies. I really like Giacchino’s main theme for the series (probably the best he’s written for film), and evidently he really likes it too because it’s been all over his scores. It’s all over Beyond too – rarely do more than a few minutes go by without it being heard in some form or other – and some people will undoubtedly now wish he’d rely on it a little less, good though it is. I used to love how Jerry Goldsmith came up with great new themes every time to go along with the roster of previous ones, and actually by half way through the 2009 movie Giacchino had probably already used his main theme more times than Jerry Goldsmith used his (exceptional) one in all five of the movies he did in the series. There was the “London Calling” theme in Into Darkness which was terrific but it was hardly heard really. This time too, there is new melodic material but it is mostly self-contained (on album at least) and so that familiar theme carries the score once again. One reason the composer’s able to get so much use out of his theme is because of how many distinct sections it has, each of which he often decomposes into motivic fragments, and he also has various satisfying, fresh takes on it to go alongside the familiar ones (the horn solo introducing the score is of course that theme). There’s a classical piano take in “Thank Your Lucky Star Date” for instance that’s just gorgeous. The biggest surprise comes when it’s turned into a kind of choral requiem midway through the stonking action cue “Hitting the Saucer a Little Hard” – aggressive brassy variants on most of the theme’s elements are sent through a series of variations before the emotional sucker-punch is applied. It’s very moving: as moving as anything I’ve ever heard the composer write, actually. Later, “Motorcycles of Relief” is another rollicking action piece based on the theme, admittedly mostly very familiar this time but still satisfying and the fresh music which plays around the theme is done well, particularly the heroic little motif that closes the cue. The pick of the brand new material comes in the score’s next most notable cue, the early “Night on the Yorktown”, which opens with gentle piano and chimes before a sensitive passage for strings leads into a lovely trumpet solo, so warm and pastoral – and then a big, exuberant, emotional melody emerges for the orchestra and choir – it’s really touching, a “the gang’s back together again” feel, and it’s a pity it’s not really explored more than a couple more times later in the score. The piece’s second half sees the orchestral forces dialled back again, but the warmth isn’t. The “Yorktown” melody gets a more restrained, very touching reprise in “A Lesson in Vulcan Minerology” before some excellent, positive variations on fragments of the main theme. The first particularly sustained villainous music comes in “The Dance of the Nebula”, surprisingly restrained until its finale, which could be from a horror movie and leads into the very dark “A Swarm Reception”, lots of complex pinched brass hits over the low strings before a cacophony of terror takes over. “Mocking Jaylah” is aggressive, hard-as-nails action writing, complete with devilish chanting – it’s seriously good. The main new villain theme gets its biggest airing in “Crash Decisions”, ominous and terror-filled and actually great fun. By contrast the subsequent pairing of “Krall-y Krall-y Oxen Free” and “Shutdown Happens” (am I the only one who thinks these joke titles have outlived their attraction now?) rumble along without doing a great deal for much of their combined nine-minute length and bring the album to a bit of a halt – maybe they could have been pruned to allow something else onto the album instead – they’re not completely dull and I’m sure they’re fine as functional music, they’re just not as good as what’s either side of them. On the latter side of them is the excellent “Cater-Krall in Zero G” which sees the score get back to its best, explosive action leading into a soaring version of the main theme. This leads into the tender finale “Par-tay for the Course”, the “Yorktown” theme given a welcome final reprise before a full version of the familiar theme for the end credits. Michael Giacchino’s music for this series has been very consistent and very impressive. It actually took two or three listens to really appreciate Star Trek Beyond but when it reveals its ideas it is a terrific score, in some ways possibly the pick of his three so far (though there is a tiny bit more filler than on the original albums from the previous two). Yes, it would have been nice for one or two of the new themes to be given a bit more chance to shine, but it’s not really a bad thing when you’re left wanting more because something’s so good. A fourth film is apparently going to go into production and I hope that – even if he isn’t exactly going where no man has gone before with his music – the composer gets to take another trip to the final frontier. Thanks for the review and explaining your opinion on Gia’s new Star Trek score. Can’t wait to receive the CD this Friday, that Yorktown theme is really wonderful. I love how Giacchino incorporates the choir in this score, reminds me a little bit of his wonderful work on last year’s “Jupiter Ascending”. So does the Courage theme get used at all? Only the tiniest snippets within the score itself, and the fanfare in the final track. 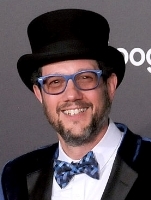 Thank you for using that most excellent picture of the dapper Mr Giacchino. Made my day. it would be nice and quite usefull if you hypertexted the composer’s name on your reviews, so we can click there and see all the reviews you made of that composer. Hey, I’m a long time reader/fellow soundtrack geek, but this is my first time commenting here. Love your reviews. I was wondering if you might sometime look into reviewing the scores to Doctor Who by Murray Gold. It’s among the most orchestral, thematic, glorious scores I’ve heard for a while. (just check out “The Sad Man with a Box” or “I Am the Doctor”), and it’s certainly worth a listen or two. Thanks! Like the score and like your review of it! I really don’t have anything to add except I really thought we’d get a full statement of the Courage opening chimes and fanfare at the top of the film, when Giacchino quotes the first two notes as we go from the (endless!) production company logos to the start of the movie proper. Why is that track not asterisked as containing the TV theme? Does two notes not break the threshold for having to give recognition? I also wish the CD presented the full end credits (even if that meant including Rihanna’s song, whatever it has to do with the movie — it’s beyond me [ah, see what I did there? ]), and not just the “‘Star Trek’ Main Theme.” As I recall, the first CD release of Into Darkness’ score did the same thing. Is this a trend? I imagine the expanded album will come next year (which I look forward to) but again with no liner notes (which I don’t). Glad to have discovered your website and look forward to reading more! I hope there will be an expanded version of this album, because the version released left out my favorite cue toward the end of the movie. any idea, when the sheet music will be published? almost no day goes by without me playing songs from the first two giacchino trek scores, I am so looking forward to playing the Yorktown theme!